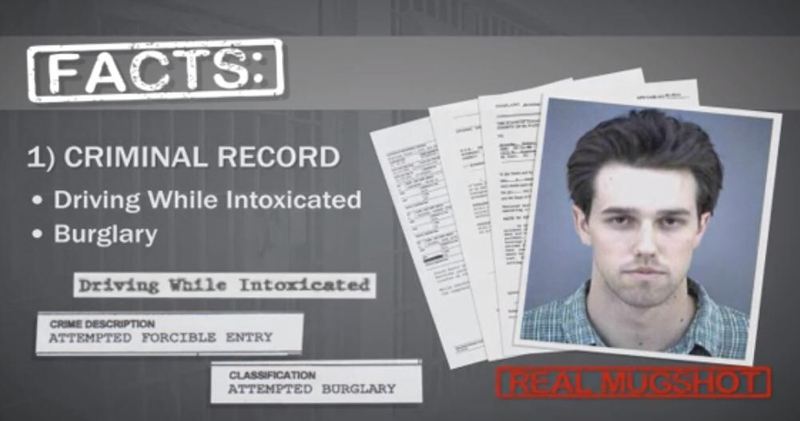 On Friday, the Houston Chronicle pulled up a police report from 1998 that shows a drunken driving arrest in the early hours after he turned 26 was more serious than previously known. O’Rourke was speeding and intoxicated, and this was already known. What wasn’t known is the newly uncovered records that contain a witness's allegation that O'Rourke tried to leave the scene of the wreck before police arrived. O'Rourke did not speak about the witness account of his alleged attempt to flee, the Chronicle reported. At the time, O’Rourke’s father, Pat, was running for El Paso County judge. The arrest was on Sept. 27, 1998, after a crash at 3 a.m. caused by drunk driving. This came just five weeks before Election Day. O’Rourke’s father lost his comeback bid. A prosecution would have been an embarrassment, but it’s uncertain if voters were aware of the drunk driving arrest. The police report found by the Chronicle shows that Beto O’Rourke was speeding in a 75 mph zone on Interstate 10 in Anthony, Texas. According to the report, he lost control and hit a truck, careening into the median. A witness told police that "he attempted to leave the scene." Breathalyzer tests showed his blood alcohol level at 0.136 and 0.134, which was well above the legal limit of 0.10 at the time. He was arrested at the scene and charged with drunken driving. He completed a court-approved diversion program and the charges were dropped after deferred adjudication. In an op-ed this week O’Rourke called the incident a “mistake for which there is no excuse.” O’Rourke was also arrested in 1995 on a misdemeanor burglary charge after jumping a fence at the University of Texas-El Paso. Prosecutors declined to pursue the case. O’Rourke declines to debate Cruz and Cruz teased him a bit on Twitter. Wonder why he was afraid to debate Cruz? Perhaps since O’Rourke is trying to get rid of the Second Amendment altogether? Texans will not take kindly to that. O’Rourke is the one on the left with the long hair, goatee, and flowery dress. Esquire found a video of O’Rourke and his band performing on an El Paso news show in 1994. The performance is complete chaos. The song they introduce does not have a name.